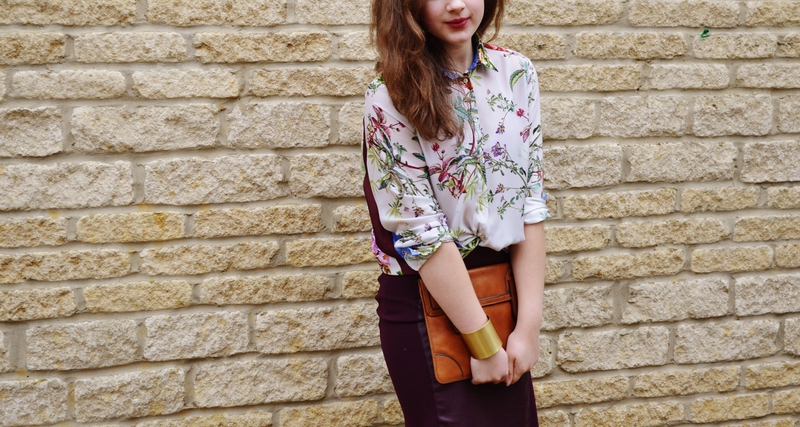 About a month ago, I bought this gorgeous Zara Printed Floral blouse. 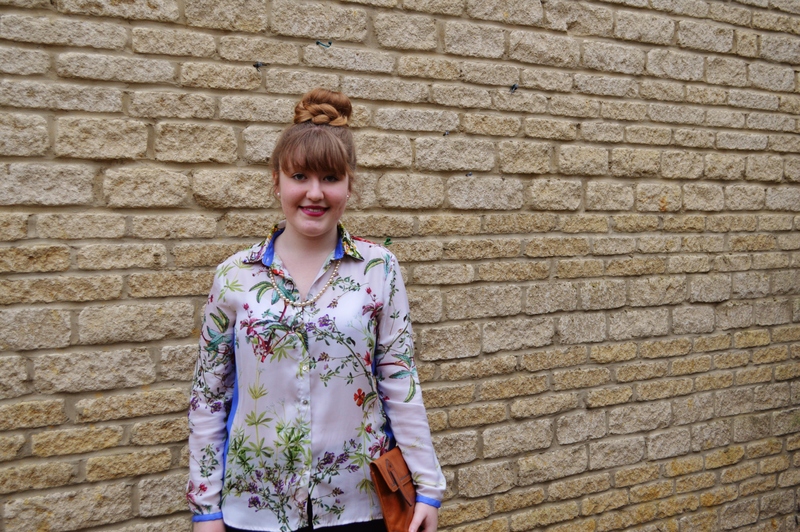 If you read my blog regularly you will most definitely be aware with my obsession for shirts/blouses and this particular one is fabulous. The large majority of my ever-expanding collection of shirts/blouses are plain and I was just thinking the other day that I really do need some more patterned, colourful ones. This one was in the sale for only £9.99 and I personally think it looks very expensive! 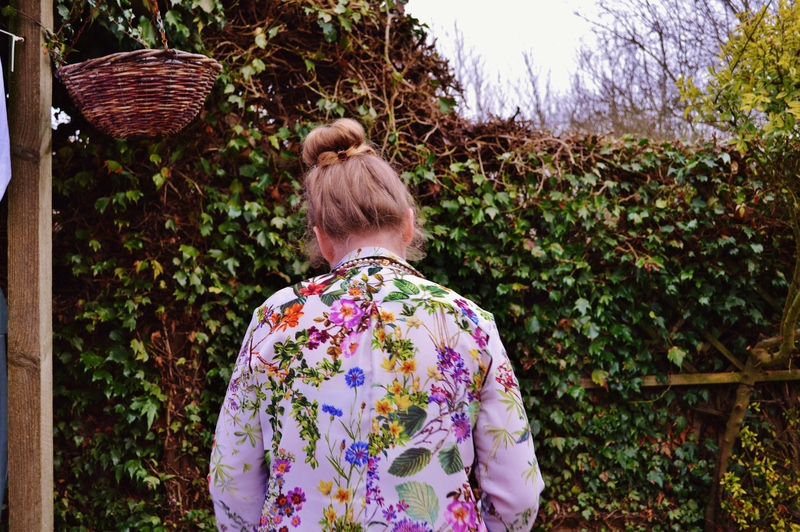 It’s a very smooth and silky, most probably imitation silk blouse and its coated in this elegant, vibrant floral pattern and also has blue and burgundy sections along the sides. 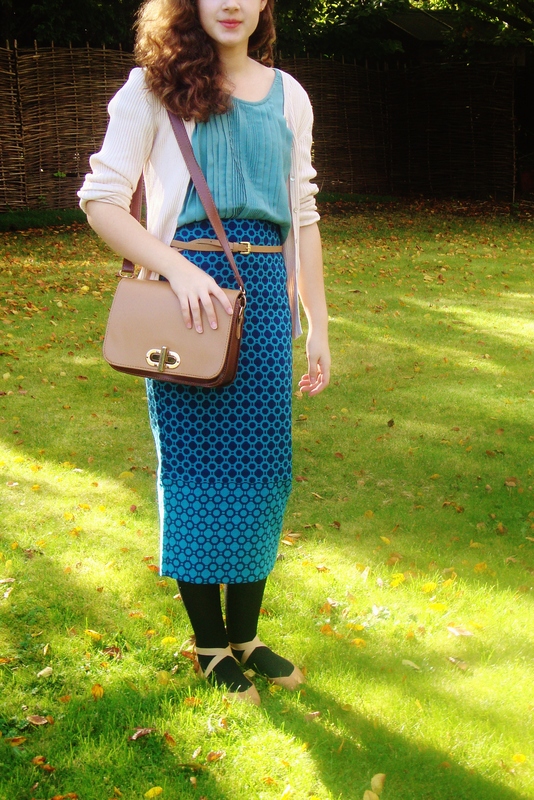 Here I have styled it in a 2 ways and I did this post with the help of my close friend Olivia! 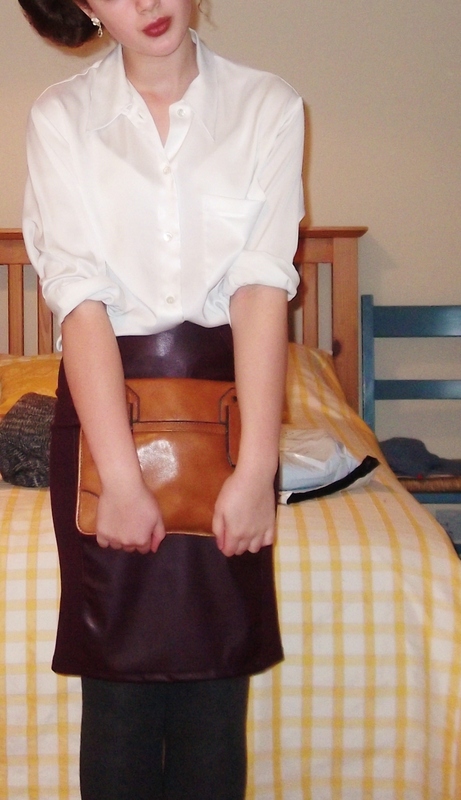 The first look is the more dressy of the two and I have simply paired it with my La Redoute burgundy pleather midi skirt, UO Brougues, pearl earrings, Fossil brown leather clutch and wavy hair. 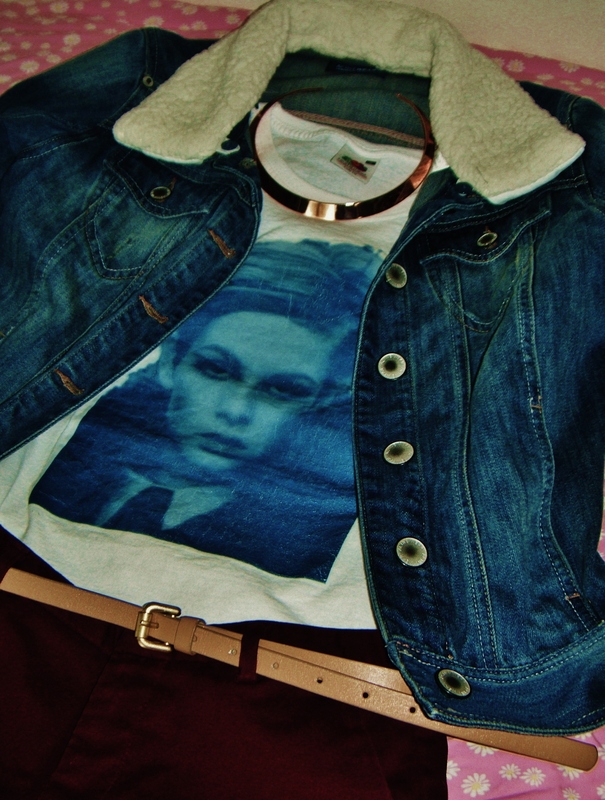 The second look is more casual and would also work well with blue skinny jeans. 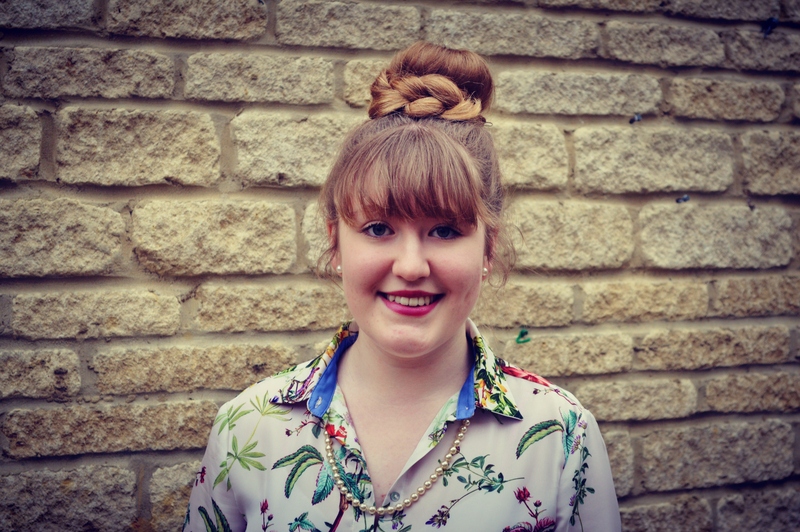 Olivia is wearing Topshop black leggings, my vintage pearl necklace, pearl earrings, Fossil clutch bag, pinky/purply lippy and I did her hair using a donut and wrapping a thick plait around it. These looks can be easily re-created and changed from dressy to casual from swapping a skirt for jeans/leggings, and all you need is a staple printed blouse/shirt. 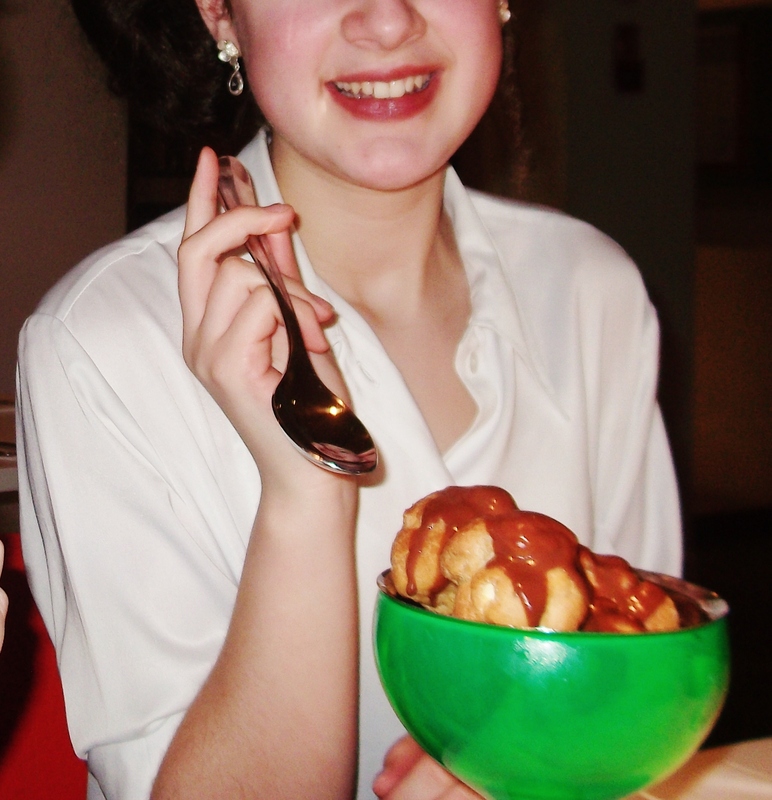 Yesterday, it was my friend Tosti’s Birthday dinner and we went out to an Italian restaurant called Ask. 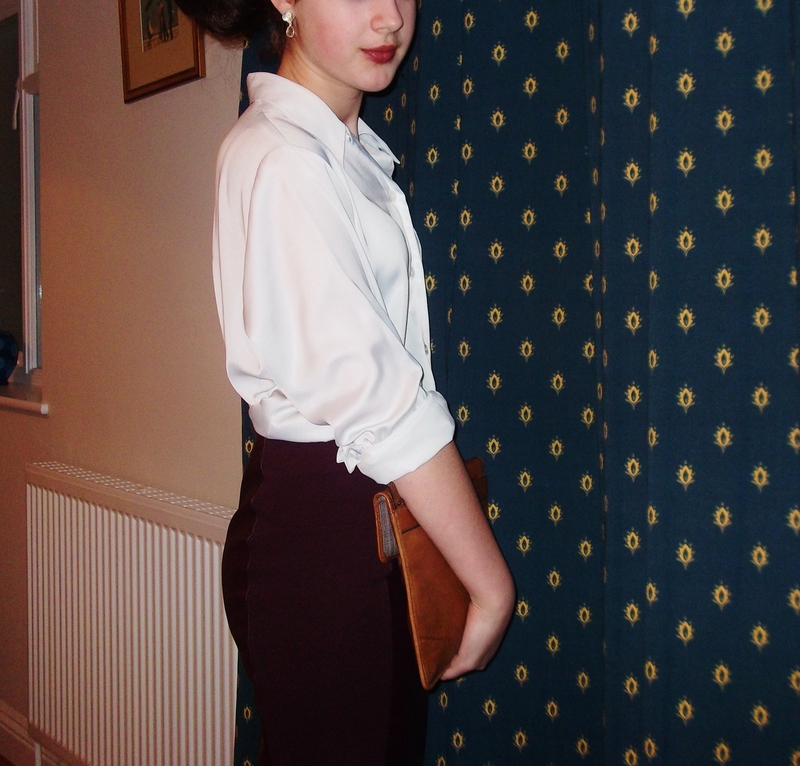 I had a great time with six other friends who came aswell and I had Fettucine Bolognese for my main and shared some delicious profiteroles for pudding(however they were quite tricky to eat and being me, got chocolate all over my face) !The outfit I wore last night features a lovely La Redoute high-waisted burgundy skirt with pleather panels- you may have also seen it dressed down a bit in another post- https://vintagevicar22.wordpress.com/2012/11/18/autumn-look-pleather-and-cute-dog-scarf/. 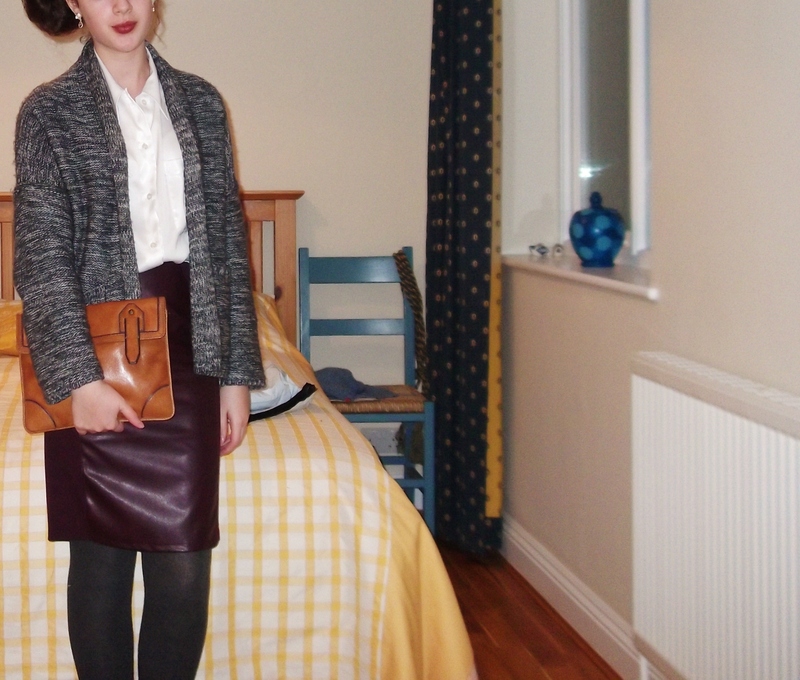 This look shows how this skirt can be dressed up slightly more for any night out! 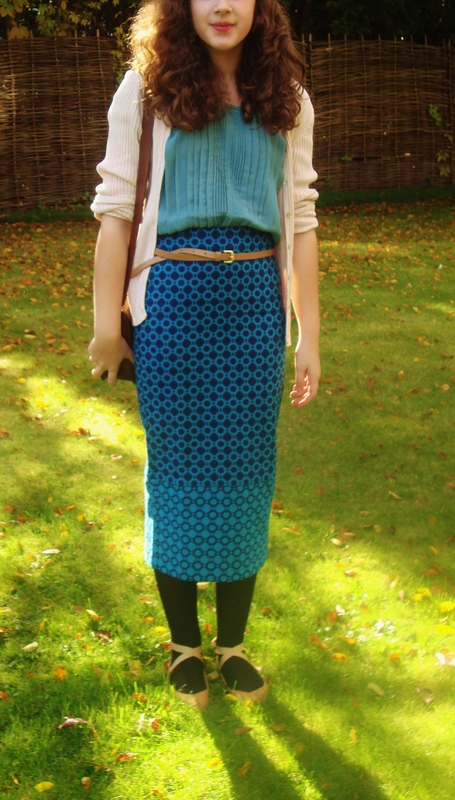 I have paired it with my vintage silk blouse, M&S thick grey tights, La Redoute grey marl cardi, UO brogues (can’t see), Fossil clutch, Rococo silver dangly earings, a huge side bun and a blackberry lip!- Enjoy! Yesterday, it was one of my best friend Rachel’s 16th birthday!! To celebrate we went firstly to Pizza Express for dinner and then went to see John Bishop the comedian perform in Birmingham!! 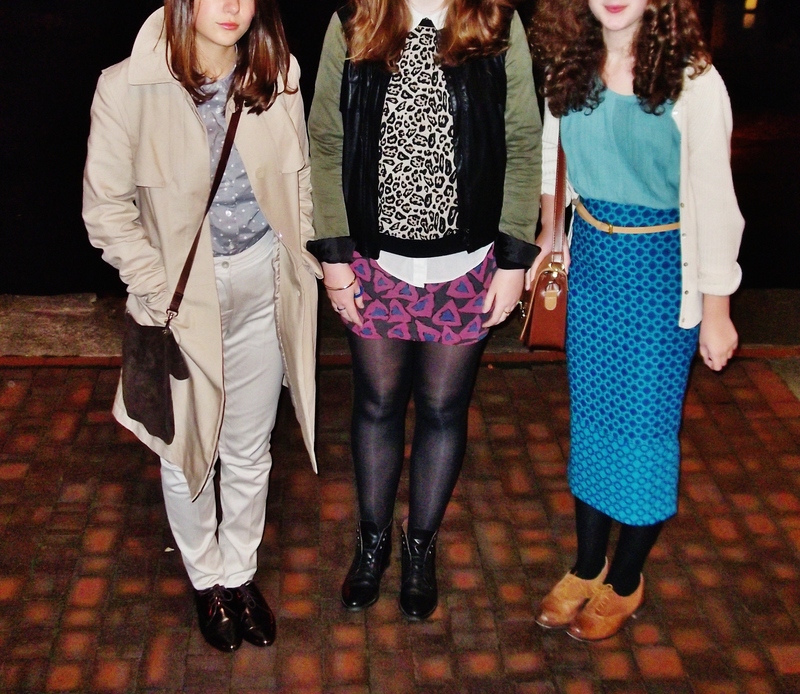 The show was fantastic and so funny and I thought I’d show you what I was wearing and also my friends’ outfits!! 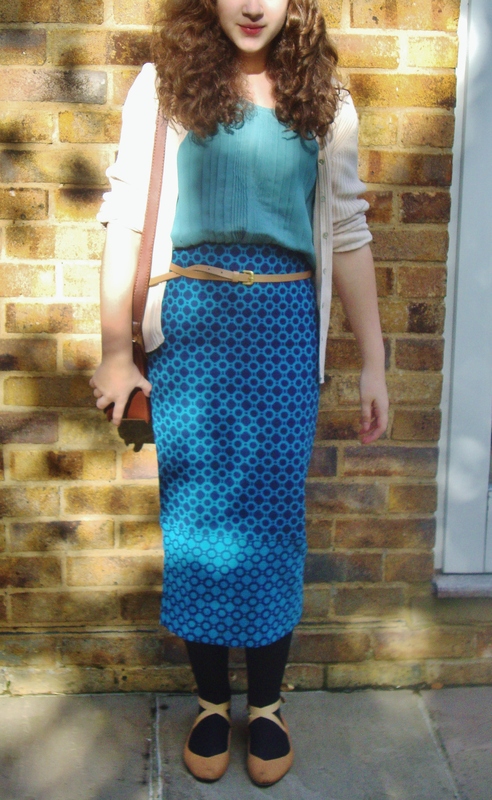 I’m wearing a Monki teal pleated blouse, vintage cream cardi, Asos Geo-print midi skirt, Clothes Show live bag, UO pumps/ UO brogues ( I changed my shoes later), Zara caramel belt and Topshop marl grey pork pie hat! !- Enjoy!! Yesterday, I went shopping in London and made a trip to Carnaby Street to go into the new Monki shop which I have been waiting almost a year to experience!! The shop’s interior design is incredibly done and you can see why they have won awards for it!! I tried on lots of things and could have bought lots of things but settled for a lovely teal pleated blouse which will be in some up-coming looks!! I also went to Oxord street/Regents street and bought an amazing grey marl pork pie hat in Topshop which you will also be seeing soon!! I really enjoyed my day out and I hope your weekend has been just as good!! 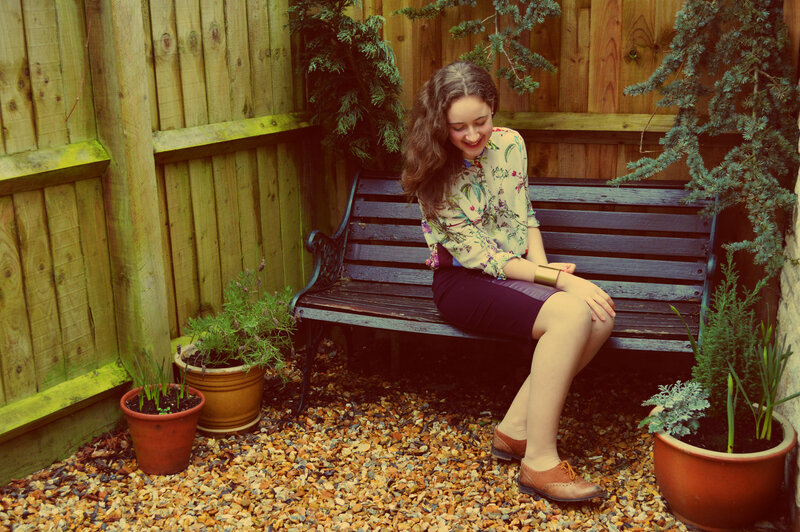 I’m wearing my vintage silk white blouse, Asos collar tips, Topshop boucle biker jacket, Topshop camel pleated skirt and UO Brogues!! Hope you like!! 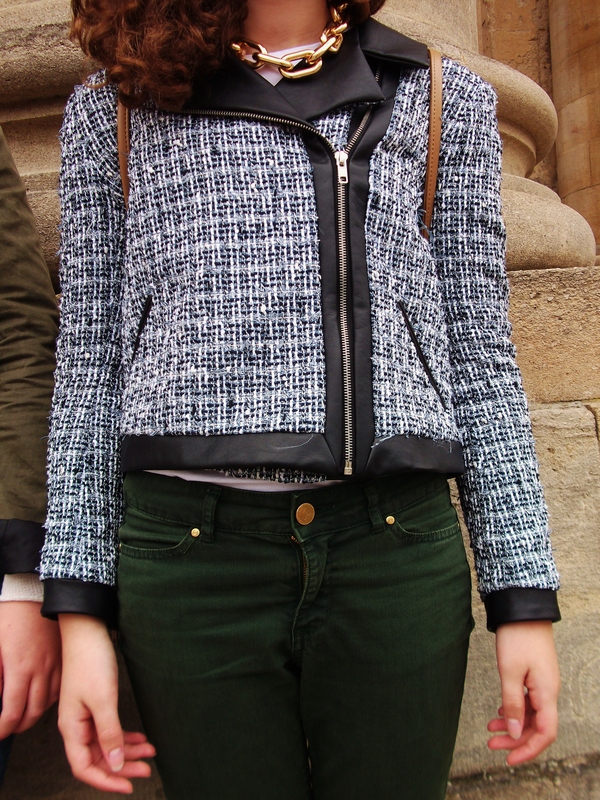 Yesterday I had a wonderful day out in Oxford with my friends!! 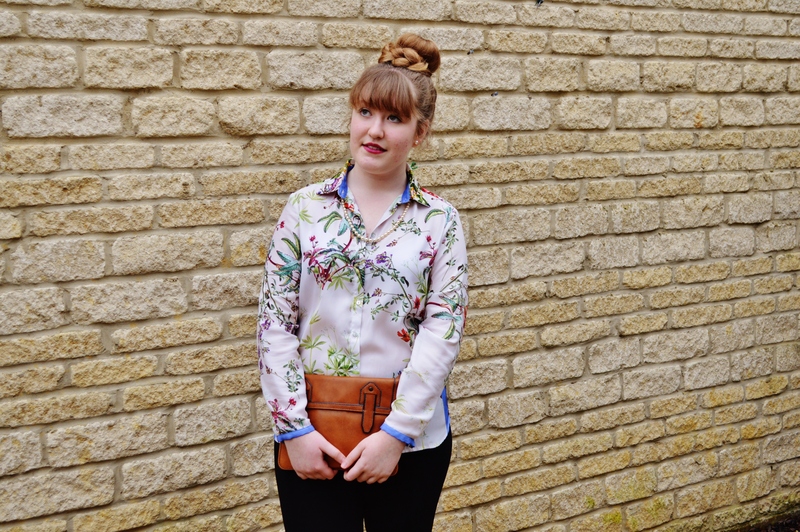 I thought I’d do a quick joint OOTD post to show you what my friends and I wore! 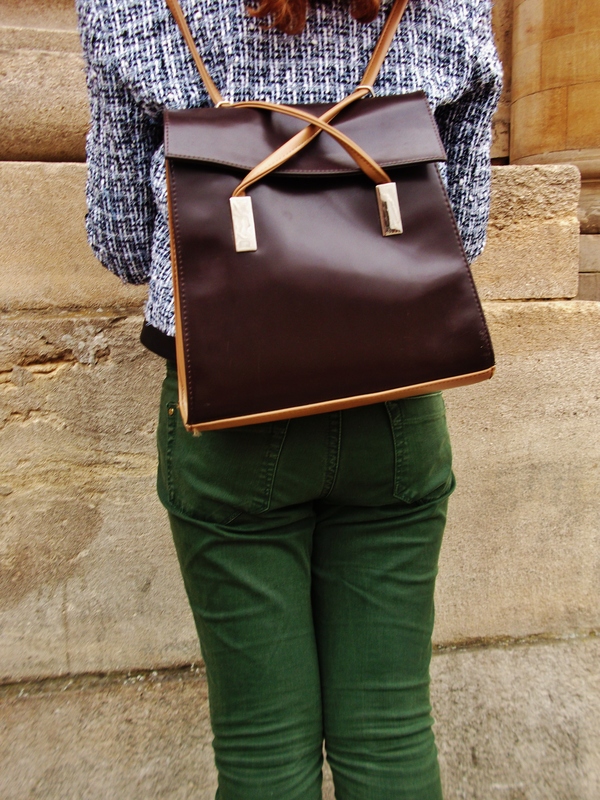 I am wearing here a Amazon white tee, Asos Chunky chain necklace, Topshop Boucle Biker Jacket, Zara Forest green jeans, U&O Brogues and a vintage backpack!! 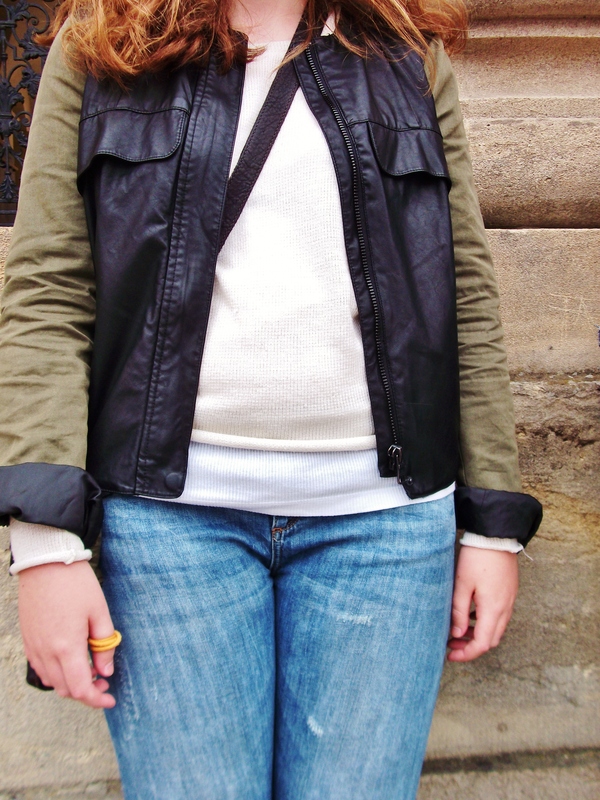 My friend Rachel is wearing a white tank, Topshop cream jumper, Zara parka/leather jacket, Levi’s jeans and red trainers! 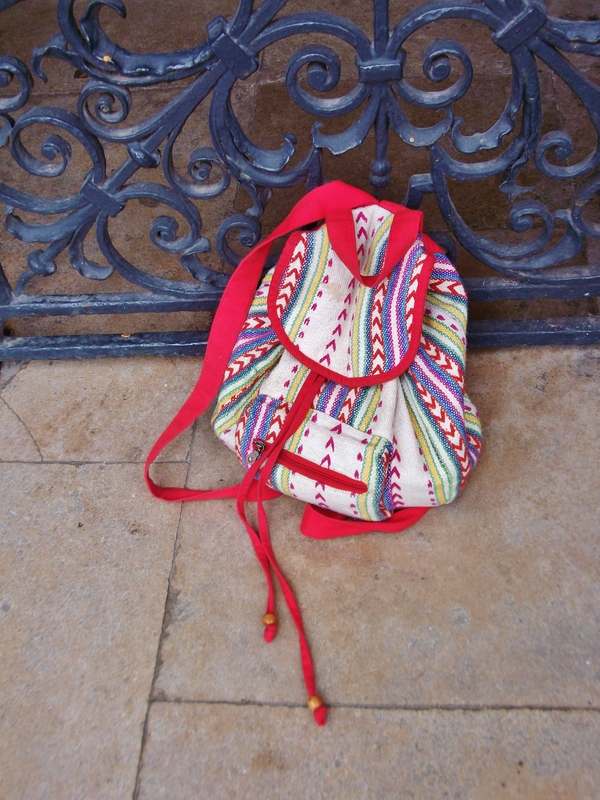 My friend Kate didn’t want to be featured but I took a picture of her TK Maxx aztec embroidered backpack which I adore!! 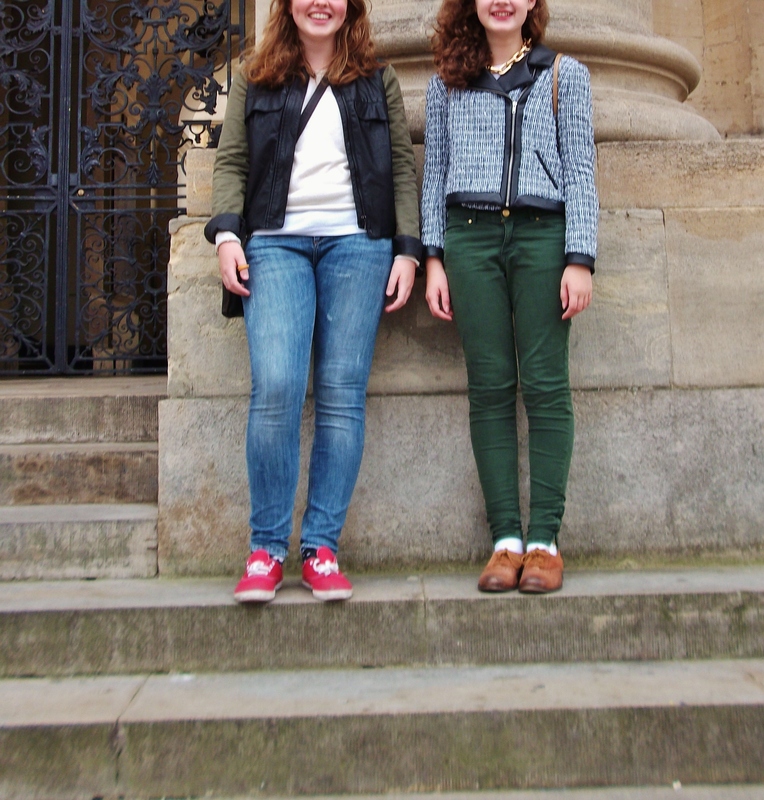 I had such a great time and Oxford has so much character to witness! !- Hope you like the looks!! 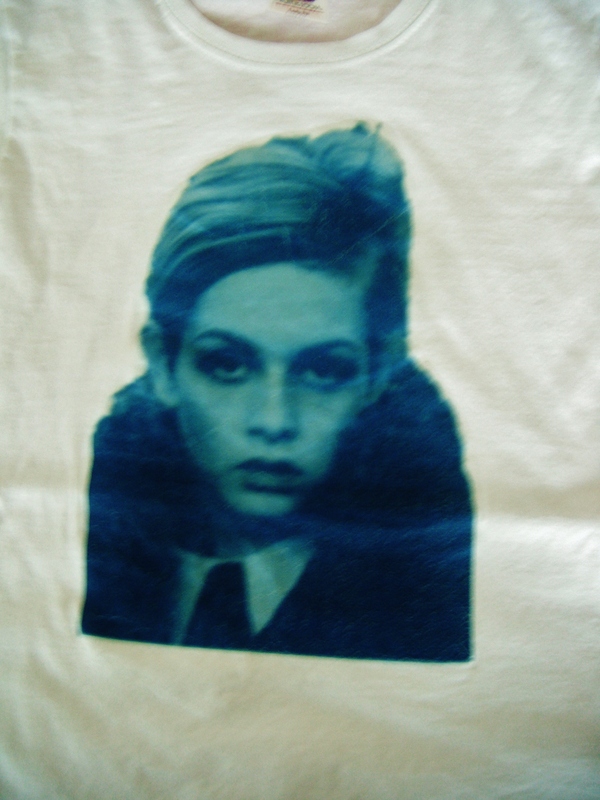 This twiggy style t-shirt is another of the t-shirts I have made using transfer paper and a cheap £2 white t-shirt off Amazon. This one is by far one of my favourites I edited it to make it this lush green blue colour. 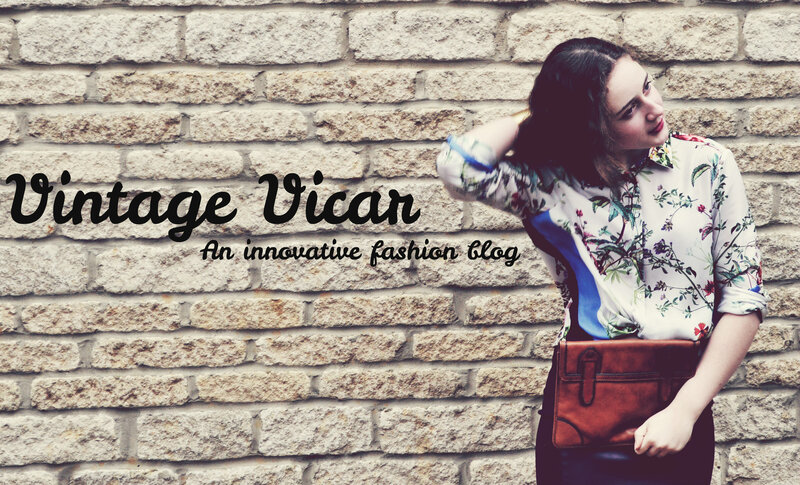 In this post I have styled it and shown how I would wear one of these personalised t-shirts. In this look I have first the Twiggy T-shirt, then I have added my H&M rose gold chocker necklace to add some glamour. Next there is my La redoute denim jacket with cream fur collar which can be detached- If you haven’t heard of La redoute it is a french company which I have bought clothes from since I was a young child. I have then tucked the t-shirt into my burgundy chinos with a caramel belt to balance out the colours. 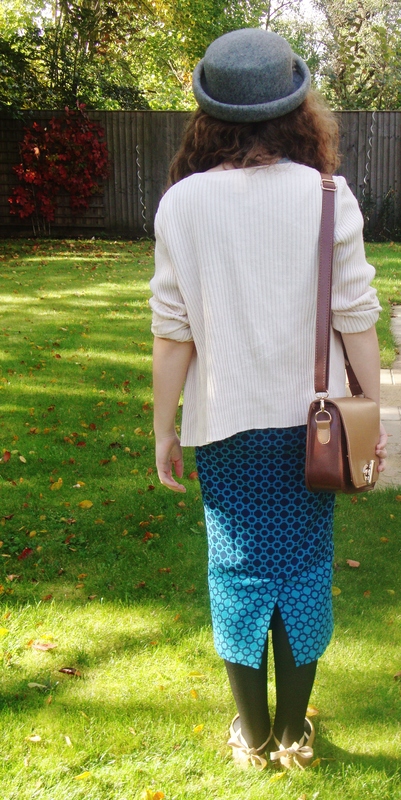 This is a fairly casual but stylish look however to dress it up a bit I would add my Topshop caramel pleated skirt- as in the picture below- Here I have added my vintage cream cardigan underneath the denim jacket, flesh tights, UO brougues and Clothes show live contrast bag.